Have you ever been worried about using your microwave oven because you’ve heard that it may harm you in some way? Or that it may destroy the micronutrients in your food? Or even cause cancer? Are these myths? Are we worrying about nothing? Or is there some truth to these? Don’t worry. By the end of this article, we will have addressed each of these concerns. Do microwaves destroy beneficial nutrients? Microwave ovens have been becoming increasingly popular since the 1960’s, due to their convenience, high energy efficiency, rapid processing time and ease of use. Researchers have since been investigating how microwaving foods may influence their nutrient content, in a good way OR a bad way. In a study published in The Journal of Agricultural and Food Chemistry, it was found that broccoli retained all of its minerals when microwaved but lost vitamin C, which leached into the added water. Does this mean that we should avoid microwaving our vegetables? Firstly, vitamin C is quite volatile in heat, so cooking in general causes its loss. Luckily, C is plentiful in raw fruits and vegetables, so you can compensate there. Now, here's the most interesting part:microwave cooking has been shown to produce the lowest antioxidant losses in 20 vegetables when compared to pressure-cooking, boiling or frying. That’s really good news. What about omega 3 in fish? A study published in Food and Bioproducts Processing investigated the effects of different cooking methods on the nutrient content of seabass. Losses of omega 3 fats were higher in the microwaved seabass than in the fried seabass. However, the researchers agreed that the fried seabass added unwanted fats into the mix and wasn’t as healthy as microwave cooking! When it comes to choosing a cooking method, it really comes down to you (or your client), your personal goals, which nutrients you want to get more of, and which ones you’re trying to avoid!. As I’m sure you’ve heard, concerns have also been raised about the use of plastic containers when microwaving food. When food is wrapped in plastic or placed in a plastic container and microwaved, chemicals from the plastic can leak into the food. This seems to be causing a lot of worry for people but, according to the Harvard Medical School, this is closely regulated: tests are conducted to ensure that unsafe amounts do not leach into foods and only containers that pass this test can state that they are approved for use in microwave ovens. On the other hand, the organisation Breast Cancer UK urges the authorities to ban BPA, a type of plastic not only used in microwave ovenware but also in most packaged products! So, if you’re concerned about these risks, switch to the safest alternatives, such as glass and porcelain containers for microwave cooking. 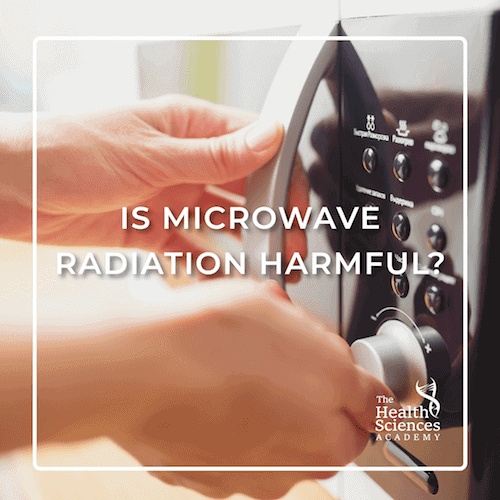 Does microwave radiation make foods radioactive? Perhaps the biggest health scare out there is inflicted by those who claim that microwaves emit ‘harmful’ radiation, turning innocent food compounds into radioactive substances capable of causing cancer. These claims are so worrying that it’s worth getting into the nitty gritty of microwave radiation. Have you ever thought about what radiation actually is? Radiation can be found all around us, in varying amounts. It is essentially the release of energy, which is given off by everyday things, such as the sun and household electrical appliances. We are always being exposed to natural background radiation. From radioactive gases given off from the earth, to radioactive substances in the soil. Have you ever had an x-ray? That’s another form of radiation. Ever used a sunbed? Also radiation. Your mobile phone gives off radiation, as do computers, heaters, and radios. It’s everywhere! So does this mean that we are in constant danger from microwaves and the world around us? Let’s investigate. Firstly, it is important to understand how a microwave works. Ionising radiation, which can remove tightly-bound electrons from atoms, causing them to become charged, is less risky in very tiny amounts (such as x-rays) but can cause problems when exposure is high (think burns and even DNA damage). However, microwaves emit non-ionising radiation; a type of radiation that has enough energy to move atoms around within a molecule but not enough to remove electrons. Because the radiation from microwaves is non-ionising, it can only cause molecules in the food to move. This is good! In other words, microwave radiation cannot alter the chemical structure of food components. More precisely, when heating food in a microwave, the radiation that the microwave produces is actually absorbed by the water molecules in the food. This energy causes the water molecules to vibrate, generating heat through this (harmless) friction, which cooks the food. This mechanism is what makes microwaves much faster at heating food than other methods. Its energy immediately reaches molecules that are about an inch below the outer surface of the food, whereas heat from other cooking methods moves into food gradually via conduction, like the bottom of a saucepan directly touching a hot hob ring. So, is microwave radiation harmful? Some say that the energy given off by microwaves is enough to damage one’s genetics (DNA) and subsequently cause cancer. But is there any good evidence to support this theory? Several studies have been carried out using laboratory animals and in-vitro systems (outside of a living organism) but few have studied living, human tissue so it is difficult to find causal associations. In 1997, Peter Valberg reviewed all of the epidemiological studies at the time, which looked at the incidence and distribution of cancer in relation to microwave radiation exposure and tried to determine whether microwaves increased the risk of cancer in humans. He found very little evidence to support a causal relationship between this exposure and disease and, whilst considering what else was known about the mechanism that microwaves use, as well as what had been observed in animal studies, he concluded that microwaves do not cause cancer. This makes sense because we know that the non-ionising radiation used in microwave ovens is not powerful enough to transfer radiation into food; it can only cause the water molecules to move. Very few scientific studies have taken place since Valberg's review. Having said that, a study printed in Molecular and Cellular Biology found that microwave radiation exposure did not show any signs of increased cancer risk in Swiss albino mice. Today, Cancer Research UK, a world-leading cancer research organisation, tell us that it’s perfectly safe to use microwaves. They also say that as long as you follow a microwave’s instructions for use, it will not cause you any harm. A huge relief, wouldn’t you say? Essentially, microwaves don’t make foods radioactive. They just heat them! It has never been proven that microwaves cause any harm to those who use them and therefore you shouldn’t worry every time you want to heat up that pot of soup or those leftover baked beans, as long as you follow the instructions of use that came with your microwave. Do you often cook your food in a microwave? Were you worried before? Has this article reassured you? And if you're itching to tell someone how microwaves work, please share this and give them some peace of mind!